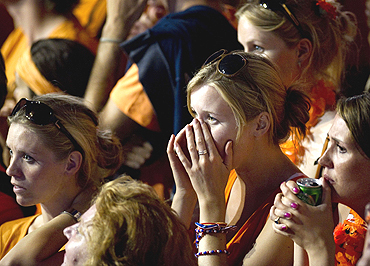 Spain gloried in a first World Cup triumph that finally buried their decades-old tag of international underachievers, but it was more agony for the Netherlands after a third defeat in the final. 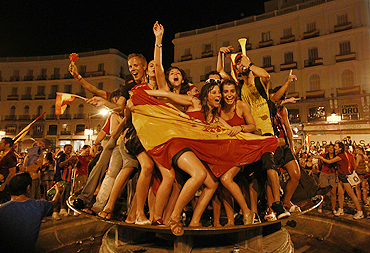 Crowds in Madrid and elsewhere partied through the night long after the last "Ole" sounded inside Soccer City, Johannesburg, scene of Spain's greatest soccer moment. "We still don't realise the full extent of this. 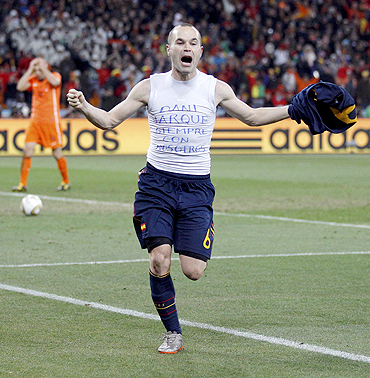 It is something incredible," match-winner Andres Iniesta said while thousands of Spaniards left the stadium singing his name. Sadly for them, their reputation as the best team never to win the World Cup will stick - for four more years at least. Yet their final encounter was a disappointing affair, spoiled by too many fouls and only just spared the agony of a penalty shootout when midfielder Iniesta stepped up in the dying minutes of extra time to make it 1-0 and game over. It was fitting that captain and goalkeeper Iker Casillas should raise and kiss the trophy first after twice thwarting speedy Dutch winger Arjen Robben when through on goal. Spain are deserved and popular winners, their midfield maestros Iniesta and Xavi playing delightful passing soccer, and David Villa proving sharp up front when most needed during the tournament. He ended up joint top scorer with five goals. More than 100,000 people flocked into the centre of Madrid to watch the game on giant screens. 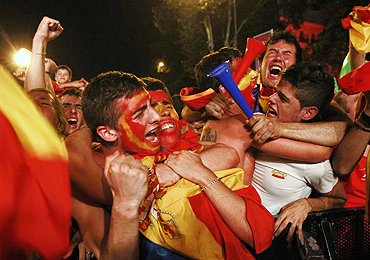 After the final whistle, impromptu fireworks displays and joyous car parades began. Spain's tennis world number one Rafael Nadal said the nation should celebrate the "unrepeatable" feat for a year. In a horrific turn of events elsewhere in Africa, two explosions killed at least 23 people in Uganda who were packed into bars watching the World Cup final. It was not known who carried out the separate blasts, but al Qaeda-inspired militants in Somalia have previously threatened to attack Uganda for sending peacekeepers there.